Shaving is one of the most common, important, and frequent things a man does on a regular basis. In some ways, shaving is a part of their religion and if not, it is at least something they do religiously. Even men who sport an epic beard still shave areas to keep it looking clean. With that said, having a razor that is efficient and reliable is a must. It needs to hold up to daily use. But there is one more thing to consider for your razor and that is whether it will work for sensitive skin. In this article, we will discuss several factors that will guide you to a better shaving experience. While skin sensitivities will vary and those with very sensitive skin will benefit greatly from this information, it is important for all shaving enthusiasts (and those who are unenthusiastic about shaving but have to anyway – we salute you!) to heed this information. Even if your skin does not seem sensitive, you can still cause damage to it. So, regardless of skin type, you should take care. Which Should You Choose for Sensitive Skin – Cartridge or Safety Razor? Safety razors are a different beast when it comes to comfortable skin. The biggest factor to consider with a safety razor is your level of experience with using one. Understanding how to properly adjust and hold the razor are vital for desired results against sensitive skin. Some razor blades can be more aggressive in their stance and therefore not appropriate for this application. If you are looking to start using a safety razor and have sensitive skin, it is best to use a razor that feels similar to the razor you are currently using. For example, if you are switching from a cartridge, you should find a safety razor that feels and handles the same way your old cartridge razor did. 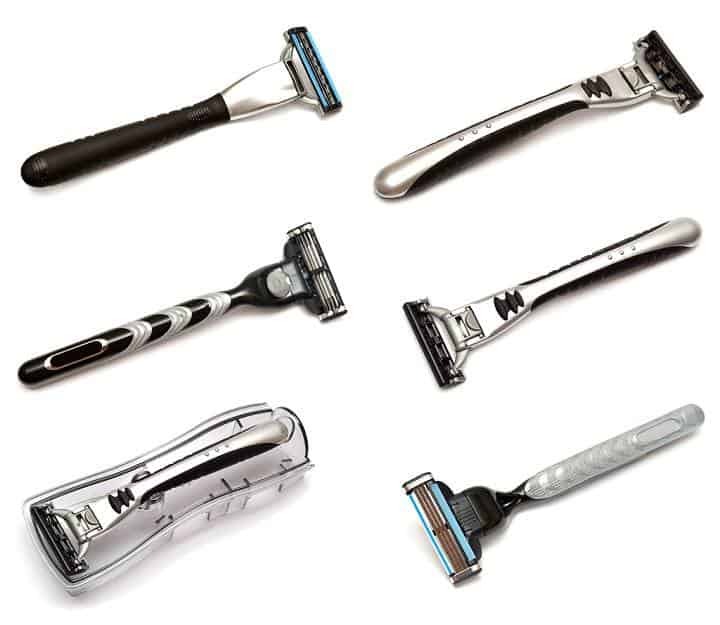 These razors are perhaps the most commonly used among men. With that in mind, there has been more research done for cartridge razors and sensitive skin than any other type. The greatest downfall in this category is weeding through the seemingly countless brands and models to find the one that is right for you. Every man’s skin is different, so you should experiment with different ones until you find the right one. One important thing to consider is that just because a particular model happens to be the latest does not mean that it is the greatest! There are some men who swear by cartridge models that have been on the market for close to 20 years. Which Cartridge Head Works the Best – Single or Multi-Blade? In this category, you have traditional straight razors and safety razors with double edges. While straight razors are a great novelty, they are probably best experienced in your local barber shop. Quite simply, straight razors are high maintenance and require time and effort that a daily shaver may not have. Furthermore, those with sensitive skin and who have never used one should probably abstain from using them. On the other hand, the safety razor makes the cut for sensitive skin users. Having a single blade on either side of the razor means that you have continuously sharp blades for a close shave. Additionally, the single blade offers great control during the shaving process. 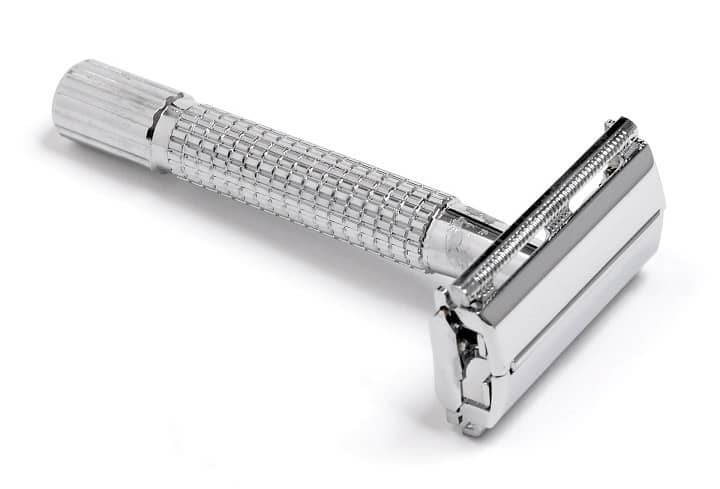 Check out our website for the best safety razor blades. The most important thing to know here is this – the more blades you have, the more blades you are sending across your skin in a single stroke. While each successive blade is designed to get closer and closer to the follicle, it is ultimately taking a toll on your skin. So, if you are using one of those fancy new 7-blade or even 9-blade razors, this is something to remember. It is probably better to find a good balance between single and multiple. 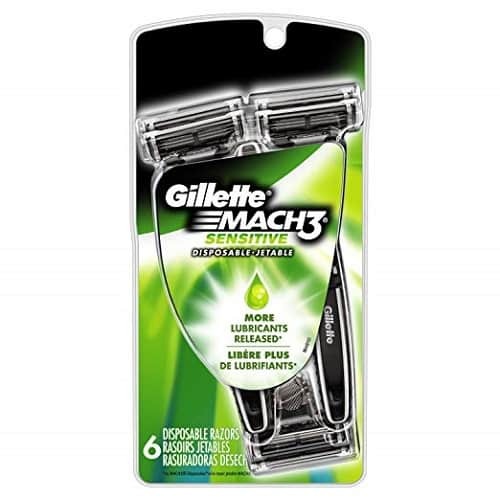 As an example, the Gillette Mach 3 has been in production for 20 years (1998) and remains the most popular cartridge multi-blade razor on the market. This may be because three successive blades were the best compromise between a close shave and comfortable results on sensitive skin. 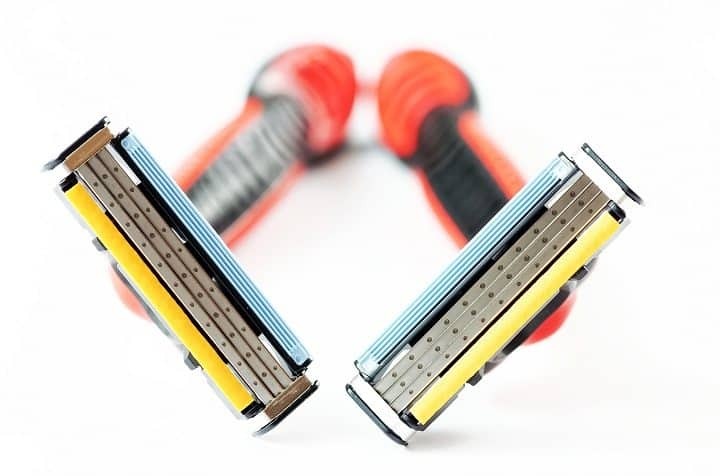 Are Electric Razors Beneficial for Sensitive Skin? In this category, there are several factors to consider. The first is what type of electric razor you are getting. 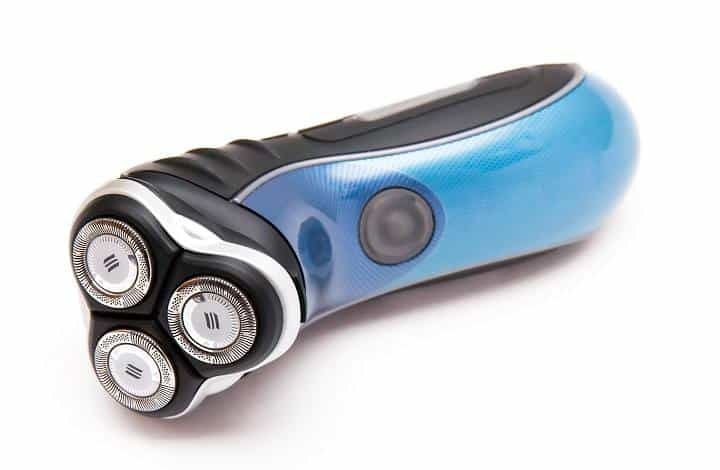 There are generally two types of electric razor – circular and foil (oscillating motion). We found that foil razors work better at achieving a cleaner cut closer to the hair follicle. That it because the circular razor tends to drag the hairs slightly before cutting them. This is because the circular blade has to push the hair to meet the stationary blade. The pitfall to a foil razor is that they tend to be less efficient at the contours of the face (i.e. the chin and jawline). Additionally, high-quality foil razors tend to go for higher asking prices than other electric razors, and you do not want to settle for a cheaper foil razor. The second point is coming to grips with higher costs up front. 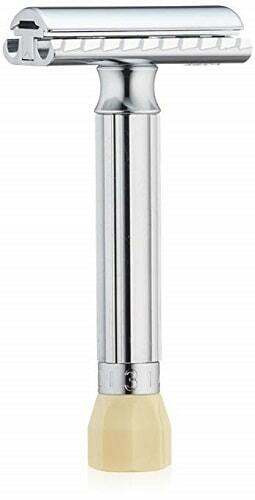 Electric razors have the benefit of being self-sustaining, keeping you from having to replace cartridges. As long as you keep it clean, it should last for a long time. The final thing to consider with electric razors is that they require charging and regular cleaning in order to last. In some cases, the razor may run on batteries, which will have to be replaced from time to time. There are a few things to consider when shaving sensitive skin. How you apply the razor and how you move it across the skin are key factors. In addition to these, you should also consider other factors like pre-shave oils and other skin prep. Regardless of what kind of razor you are using, you want to make sure the pores of your skin are nice and open. The best way to do this is to either shave after taking a hot shower (a soft scrub cleanser is the best face wash for men) or by applying a hot towel to the area for a few minutes to open the pores up. You will find that the shave is smoother and less taxing on your skin. Pre-shave applications like shaving oil work great at protecting your skin during the shaving process. Pre-shave oils are also one of the best beard moisturizers. Utilizing warm shaving cream is another great way to prepare for a sensitive shave. The best shaving cream warmer will warm the cream prior to lather. Utilizing hot water during the rinse process between strokes is also fundamental to a comfortable shaving experience. Pre-shave oil should be incorporated into your daily routine. After getting out of the shower, and before shaving, apply this oil to your face. The oil works to lubricate the blades on the razor and results in a cleaner and more comfortable shave. It is best to use natural pre-shave oils like Jojoba or castor oil. While these oils offer better lubrication overall, they also provide necessary nutrients to the skin in the process of the shave. In particular, castor oil actually works to reduce toxins and unwanted bacteria from the skin. This means more sterile shaving in the long run. This may seem like a no-brainer, but the most important thing about the shaving cream is its lather. If shaving cream warmer does not lather properly, it is no good. Beyond that, you should look for an unscented cream as they do not have any extra ingredients that may be a contraindication to those with sensitive skin. In some case, people with skin allergies can have severe reactions to scented creams. Unscented aftershaves are best for sensitive skin. As discussed with the shaving creams, the chemicals used in scented aftershaves can cause serious discomfort or even allergic reactions in those with sensitive skin. Some aftershaves have either cooling or medicated substances that create a cooling effect. These have been popular for a long time but will cause burning sensations and even rashes on sensitive skin. The best way to clean your razor is to use a rubbing alcohol to sterilize the razor. Otherwise, soap and water will suffice. Just remember to reapply lubrication to the razor after to do this. Rubbing alcohol especially will dry the razor out. Remember to apply a shave oil to the razor as well to lubricate the blades and keep them from dehydrating. Whether you are shaving completely or just certain areas on your face to keep your beard look neat and clean, the razor you are doing this with is the crucial tool that will make or break the process. That’s why it needs to be durable and sharp, yet forgiving, especially if you have a sensitive skin. 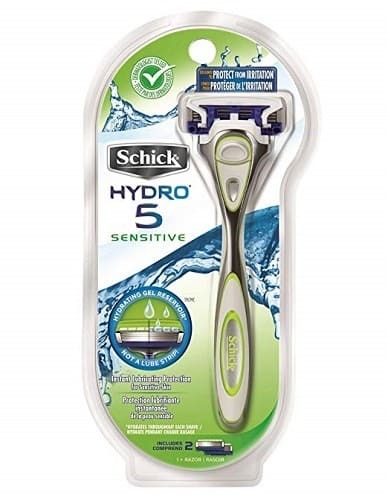 The unique hydrating gel reservoir of the Schick Hydro 5 Sensitive Skin Razor keeps your skin hydrated for up to one hour after every shave protecting it from irritation. You can say that the manufacturer is pioneering when it comes to this feature as none of the competitors has anything similar. 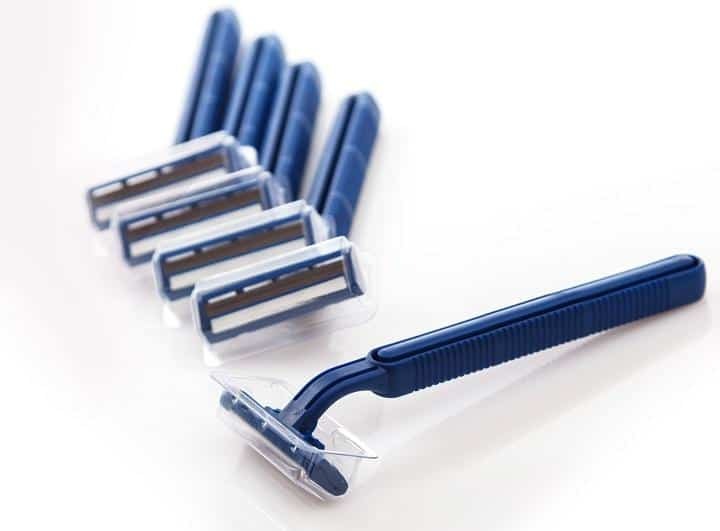 For the best and the smoothest shave ever, there are 5 ultra glide razor blades with skin guards. Flip trimmer offers a convenient design that helps you get to those hard-to-trim places. With a simple flip of the thumb, the hydrating gel reservoir will flip back allowing you to use all 5 blades while trimming. Ergonomically designed, premium, high-gloss colored chrome and soft touch rubber handle make this razor fit perfectly and naturally in your hand. 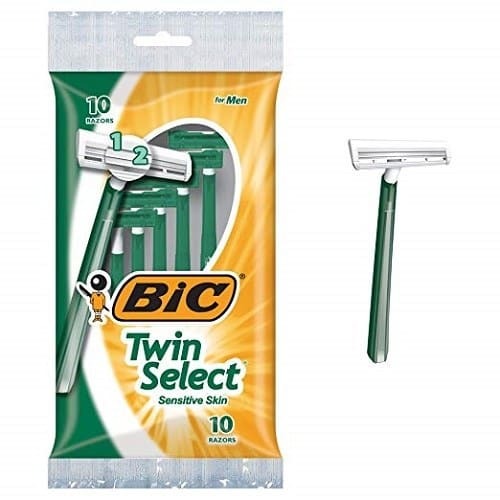 Three packages of ten razors each for the unbeatable price is what you get with the BIC Twin Select Disposable Razor. It features two blades that give men with sensitive skin one of the most soothing and comfortable close shaves ever. With the batch of 30 razors, you are going to be supplied with this products for a long time, providing that you get 8 to 10 shaves out of each. The head on the razors is pretty slim, while the handle is long and tapered. This enables you to get a comfortable grip and have more control over the process of shaving. For most curvy areas on your face, this will do the trick. However, you may find it hard to get to some hard-to-reach areas because the head of the razors doesn’t swivel. Snap-on covers make it very easy to slip your disposable razors into your travel or any other bag and use them when you need some touch-ups along the way. 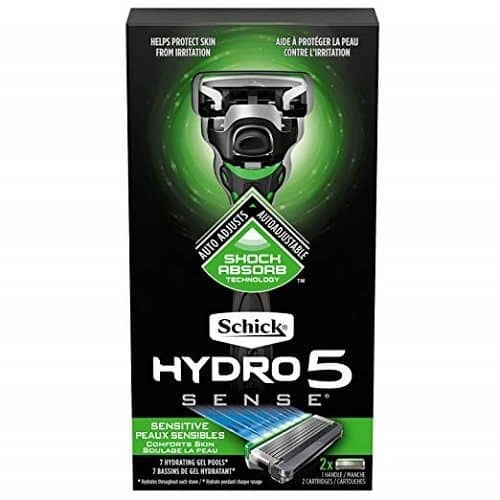 Innovative shock absorb technology in the Schick Hydro Sense Sensitive Razor features a built-in mechanism that responds to pressure and auto-adjusts the razor to contours and curves of your face. In cases when you apply to much pressure, it will back off, stopping you from hurting yourself. When you don’t press hard enough, this technology will do it for you and will add some pressure. This precise formula contains a sensitive gel with herbal extracts that comfort your skin, while the 5 ultra-glide blades with skin guards protect it from irritation. With many blades, the number of points of contact between the blades and the skin is doubled, allowing you to control the skin flow and reduce irritation. Instant lubricating protection is ensured with the 7 gel pools and flip trimmer switches between shaving larger surfaces with all 5 blades and precision trimming with one blade. All this happens with a simple flip of the thumb. 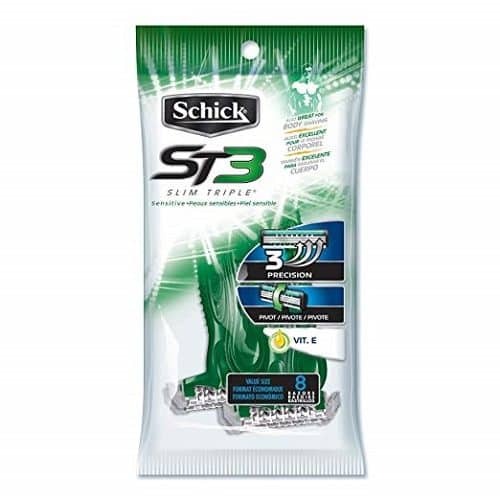 One of the first things you are going to notice with the Schick Slim Triple Disposable Razors is how close shave you get thanks to the 3 precision blades they have. A lubrication strip with aloe and vitamin E seems like a fantastic addition that makes the shaving extraordinarily smooth and seamless. The blades are spaced perfectly, so they don’t clog up during the shave, allowing trimmed hairs and lotion to come off between them quickly. Taking into consideration that you get 8 razors in the pack, with proper care these items will last you for at least 3 months or so. Good spacing between the blades and pivoting razor head will make sure that you don’t get any razor burns or nicks. The handle is a bit longer and wider, which provides a good grip preventing any slippage. Also, the blade attachment is well assembled and will never fall off the handle. For a lot of years, men have been shaving with MERKUR Razor because of its effectiveness in giving better, more comfortable shave when compared to other brands. 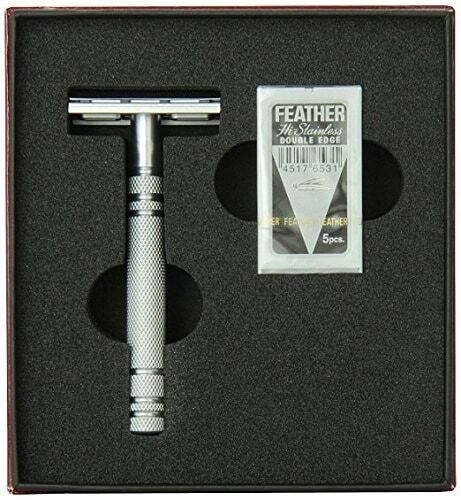 The first thing you are most likely to notice about it is the heavy head, shorthand and an extra thick handle that allow easy holding and maneuver, so you can get a perfect close and safe shave every time. The moment you start shaving with this razor, you can say goodbye to ingrown hairs and skin irritations that usually occur after multiple-blade shavings, thanks to the double edge blades that are durable and high in quality. You can easily find the replacement for the blades at an affordable price. When you purchase this product, you’ll find an included sample blade. Using this razor for wet shaving is very easy. All you need to do is apply the lather on your skin and then hold the razor at a 30-degree angle while working. Designed with sharp blades that cut close, Gillette Mach3 is the best you need to achieve an all-time close and smooth shave in fewer strokes. When you start shaving with it, you’ll experience a perfect smooth glide that’s provided by the lubrastrip. Also, the soft and protective microfins are able to gently smooth down the skin so the blades can shave evenly and easily. You’ll notice that’s extremely easy to rinse this razor after use due to the open architecture design. Furthermore, it can easily adjust to your skin type thanks to the spring-mounted pressure control design. After using it for some time, you’ll realize that it’s very gentle on sensitive skin and doesn’t cause irritation. Once you start using Feather Razor, you’ll notice the high-cutting performance of its five blades that are actually one of the sharpest you can find on the market. While shaving, you are most likely to feel the tight grip on the handle, thanks to the cross-sectional grooves that look small like diamonds. The three horizontal grooves near the head also help improve holding for easy and effortless shaving. The short handle is meant to allow you to comfortably rest your small finger so you can get full control while shaving. This product is also popularly known as mild razor since it doesn’t expose much of the blades and is therefore very forgiving to sensitive skin and gives a close shave without any irritation. 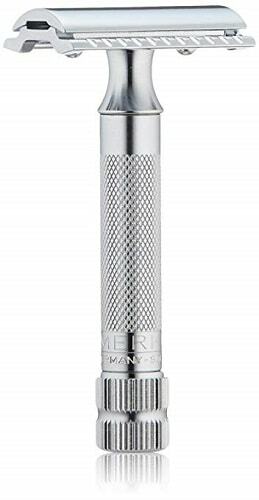 No other razor in the market can give you better shaving control like MERKUR Progress. This is because of the handle with the knob that enables you to use the five setting system to fine-tune the closeness of the shave. Even though the handle feels smooth to hold, the protruding adjustment knob helps provide good grip. To prevent slippage, it’s advisable to rest your small finger at the base of the knob. Loading the blades in this razor is very easy thanks to the two-piece design. Upon positioning the blades in the razor, all you need to do is rest your index finger on top before tightening. You need minimal efforts to use this item for shaving. Simply apply the lather, hold the razor at an angle of 30-degrees and allow the weight to do the work as you shave. 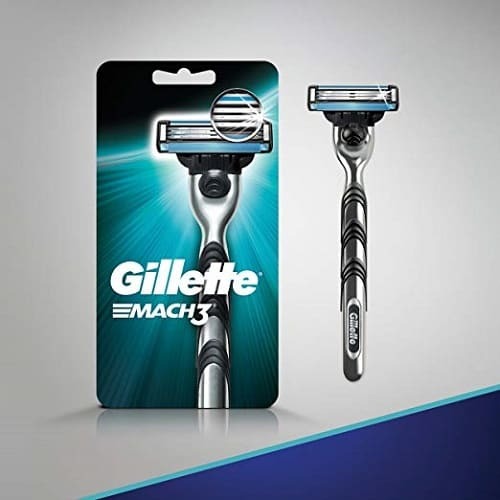 With a durable design that includes sharp blades that are stronger than steel, you can rely on Gillette Mach3 to provide you with an all-time smooth and close shave. Every razor blade refill is well made to last for up to 15 comfortable shaves. While shaving, you’ll realize that the blades are gliding smoothly across your skin thanks to the lubrication layer or strip glides that also help guard your skin against irritation and redness. You don’t have to worry about nicks and cuts because the design of this product features an effective skin guard that plays a vital role in stretching your skin and preparing your hairs for cutting. Even if you have a heavy or thick beard, three sharp and long blades will still provide you with a very smooth and close shave. Photos from: Ian_2010 / depositphotos.com, Cosmin35 / depositphotos.com, Daxiao_Productions / depositphotos.com, alldma / depositphotos.com.